Heat oven to 350°F. In medium bowl, mix 1/2 cup brown sugar and the butter. Stir in 1 cup flour. Press in ungreased rectangular pan, 13x9x2 inches. Bake 10 minutes. Meanwhile, in medium bowl, mix eggs, 1 cup brown sugar and the vanilla. Stir in 2 tablespoons flour, the baking powder and salt. Stir in semisweet and milk chocolate chips. Spread over crust. 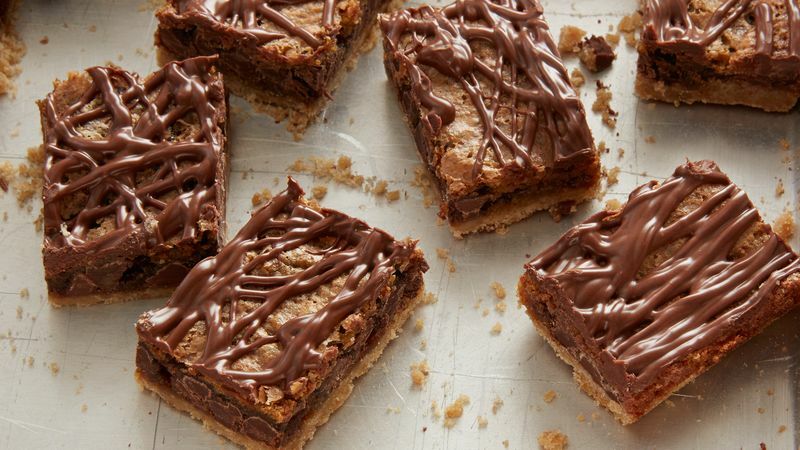 Bake bars 15 to 20 minutes or until golden brown. Cool completely in pan on wire rack. In 1-quart saucepan, heat all Chocolate Glaze ingredients over low heat, stirring constantly, until chocolate is melted. Drizzle glaze over cooled bars. Refrigerate at least 1 hour until firm. For bars, cut into 8 rows by 4 rows. Store at room temperature. For lots more bars, cut into 8 rows by 6 rows. Dessert lovers like trying one of everything and with smaller servings they can do it.